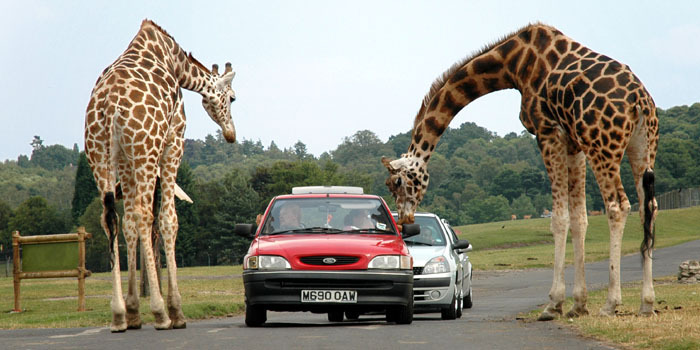 A SAFARI PARK, sometimes known as a wildlife park, is a zoo-like commercial tourist attraction where visitors can drive in their own vehicles or ride in vehicles provided by the facility to observe freely roaming animals. The main attractions are frequently large animals from Sub-Saharan Africa such as giraffes, lions, rhinoceros, elephants, zebras, and antelope. A safari park is larger than a zoo and smaller than game reserves. For example, African Lion Safari in Cambridge, Ontario, Canada is 750 acres (3.0 km²). For comparison, Lake Nakuru in the Great Rift Valley, Kenya, is 168 square kilometres (65 sq mi), and a typical large game reserve is Tsavo East, also in Kenya, which encompasses 11,747 square kilometres (4,536 sq mi). Safari parks often have other associated tourist attractions: golf courses, carnival rides, cafes/restaurants, miniature trains, and gift shops. A SAFARI is an overland journey, usually a trip by tourists to Africa. Traditionally, the trip was a big-game hunt, but today, safari often refers to trips to observe and photograph wildlife—or hiking and sight-seeing. Safaris have today diversified considerably from the initial fledgling expeditions of the pioneering European explorers and colonialists. Tourism is becoming an increasingly prevalent economic factor for many Eastern and Southern African nations, in several regions surpassing traditional industries such as agriculture. Lending to specific conditions such as relative infrastructure or inherent geography countries such as Tanzania, Kenya, Botswana, Zambia, Namibia, Uganda, South Africa, Democratic Republic of the Congo and Zimbabwe advertise locally specialised safari experiences ranging from guided safaris, mobile safaris, walking safaris and fly-in safaris to more niche concepts including elephant back safaris, river safaris, primate safaris, horseback safaris, balloon safaris photographic safaris, mobile tented safaris, and accessible safaris for those with disabilities. 8 of the best safari destinations in Africa - CNN travel. 10 best new luxury safaris for 2017 - CNN Travel. African Tours & Safaris - go2africa. MOST POLULAR SOUTH AFRICA SAFARIS - Siyabona Africa. South Africa: Poacher killed by elephant then eaten by lions - "A suspected rhino poacher has been trampled on by an elephant then eaten by a pride of lions in Kruger National Park, South Africa." abercrombie & kent - "Luxury African Safaris." Journey to the unspoiled natural beauty of Africa for an unforgettable luxury African safari experience. Abercrombie & Kent pioneered the modern safari, and no one has higher standing in Africa. Our longstanding relationships from Nairobi to Cape Town allow us to offer an unrivaled safari experience, from luxurious mobile camping to the finest expert-led game viewing in Africa. Inkulu African Safaris - "Best Hunting Safaris." Hunt one of 50 game species on a private reserve of 20 000 hectares. Micato Safaris - "African Luxury Safaris." The Travel + Leisure #1 Nine-Time Winner. NYATI - South Africa. "World-Class Safari in Africa." OKAVANGO TOURS & SAFARIS - "We design perfect tailor-made Africa safaris." Safaripark Beekse Bergen - Hilvarenbeek, The Netherlands. "Sleep Among the Wildlife." SUN SAFARIS - "Botswana and South Africa safaris and tours offered by Sun Safaris. We specialise in safaris to Southern and East Africa." The Luxury Safari Company - since 2010. "Unrivalled Africa Specialists." We are a global luxury safari company established in early 2010 by experienced luxury safari specialists, and are able to book flights and tailor make exclusive safari itineraries for clients from every corner of the world. Theunis Botha Big Game Safaris - since 1983. "Theunis Botha perfected Leopard and Lion hunting safaris with hounds in Africa. He pioneered traditional European Style Driven Monteria hunts in South Africa. A passionate and professional hunting outfitter operation focussed on giving his clients a unique exiting. African safari experience. Specialists outfitter in Leopard hunting in Africa with big game hounds." ULTIMATE AFRICA SAFARIS - since 1996. USA based African travel specialists: Botswana, Tanzania & South Africa. UMFOLOZI RIVER LODGE AND BIRD PARK - South Africa. "Situated on 4 hectares of forested hillside overlooking the Umfolozi flood plain next to a private game reserve, Umfolozi River Lodge is the ideal getaway for both the businessman and family alike." West Midland Safari & Leisure Park - Spring Grove, Bewdley, Worcestershire, England. wilderness safaris - "Founded in Botswana in 1983, Wilderness Safaris is widely acclaimed as the continent’s foremost ecotourism operator. We give our guests life-changing journeys in some of the most remote and pristine areas in Africa and in so doing help conserve Africa’s spectacular biodiversity and share ecotourism’s benefits with rural people." WILDLIFE SAFARI - since 1972. Safari park in Winston, Oregon, United States. It is home to hundreds of animals that wander freely over the 600-acre (240 ha) park, which guests can drive through. WOBURN SAFARI PARK - since 1970. Safari park located in Woburn, Bedfordshire, England. Visitors to the park can drive through exhibits, which contain species such as southern white rhino, elephants, tigers and black bears. It is part of the estates of the Duke of Bedford that also includes Woburn Abbey and its 3,000-acre (1,200 ha) deer park. The Safari Park itself covers 360 acres (150 ha).